CAMBRIDGE, Mass.--(BUSINESS WIRE)--WAVE Life Sciences Ltd. (NASDAQ:WVE), a genetic medicines company focused on developing stereopure nucleic acid therapies for patients impacted by rare diseases, today reaffirmed its commitment to advance next-generation nucleic acid therapies to address the significant unmet need of patients diagnosed with Duchenne Muscular Dystrophy (DMD). 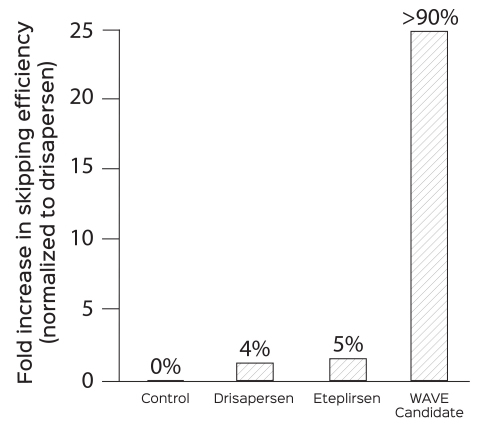 WAVE’s DMD program is based on preclinical data demonstrating an approximate 25-fold improvement in exon-skipping efficiency compared to drisapersen and eteplirsen, suggesting the potential for improved potency and an enhanced ability to restore the production of functional dystrophin. In addition, WAVE’s proprietary muscle targeting technology has demonstrated substantial improvement in distribution to critical tissues in animal models, including skeletal muscle, diaphragm, and heart. WAVE Life Sciences Ltd. (NASDAQ: WVE) today reaffirmed its commitment to advance next-generation nucleic acid therapies to address the significant unmet need of patients diagnosed with DMD.